SmartOffice is built for your life insurance and annuity business. Our industry-proven solution tracks all product and policy details, as well as all activity related to selling, underwriting, commission tracking, and servicing. Simplify insurance tracking with easy-to-use, easily configurable workflows. Accelerate sales and secure revenue with out-of-the-box presale and underwriting workflows. Support thousands of agents using one accurate, centralized database containing all of your insurance, annuity and agent data. Stop relying on complex Excel spreadsheets and move to a web-based, mobile-friendly platform. To learn more, call us at 800-777-9188 or email us. SmartOffice is the market leader in tracking insurance and annuity distribution contracts, product definitions and commission payments. Our platform also excels in providing the auditing capabilities you need to account for every dollar you're owed. Project commissions on even the most complex multi-party distribution contracts. See what you've been paid and what you're owed on first-year and renewal commissions using our reconciliation workflows. 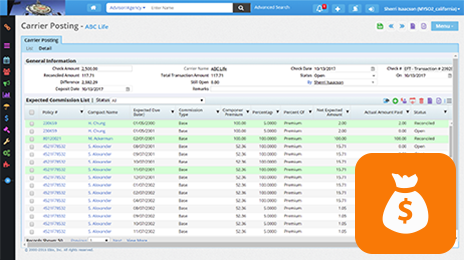 Track accounts payable and accounts receivable with your own advisors as well as your carriers, BGAs, and IMOs. Automatic, customizable reports keep you up to date on the status of business, projected revenue, and underwriting performance. Provide timely updates to your advisors and clients through on-demand reports and automatic report e-mails. Empower your business managers with the reports they need, tailored to their personal approaches to analysis and decision-making. Define custom criteria to identify sales and underwriting issues, and automatically alert all interested parties. SmartOffice tracks all presale and underwriting activities and communications around sales opportunities in a way that helps you satisfy compliance officers and regulators. SmartOffice is compliant with SSAE-16, OCIE Cybersecurity, and NY DFS Cybersecurity. SmartOffice undergoes regular audits by large clients like Merrill Lynch, Edward Jones, Pershing, and Fidelity. SmartOffice provides a turn-key platform for Fiduciary Rule support for annuity sales and qualified money. SmartOffice imports data feeds from all major life insurance and annuity carriers, BGAs, and IMOs to bring you current status information on pending and inforce business. Eliminate the risks associated with manually tracking pending business by relying on our automatic daily updates. Gain greater insights into the status of revenue using commission data direct from the insurance manufacturer on each case. Immediately identify at-risk cases with paramedical service detail updates in near-real time. Our platform delivers system integration and activity tracking between BGA and IMO sales assistants and the bank’s sales team for quotes, illustrations, needs analysis, and other presale activity. Effortlessly track the data you need to evaluate how well your BGAs are performing for you. Eliminate the costs of following up with your BGAs and IMOs for every status update. Enjoy seamless integration with all major distribution platforms for analyzing client needs, creating illustrated proposals, and electronically applying for new policies. SmartOffice allows you to embed client/prospect policy data into the sales team’s CRM of choice. Display details about your clients' policies and pending cases on the same screens advisors view for demographic and financial information. Provide advisors with presale insurance workflows and template-based e-mails and letters that they can launch from their CRM or Microsoft Outlook. Provide advisors with access to life and annuity electronic applications from their CRM. Explore all our software features.